March 3 Update following accident. Ray saw highly recommended physical therapist, Shira Siegal, who removed the surgical cast, re-dressed the fingers, and created a custom removable orthopedic brace/splint. 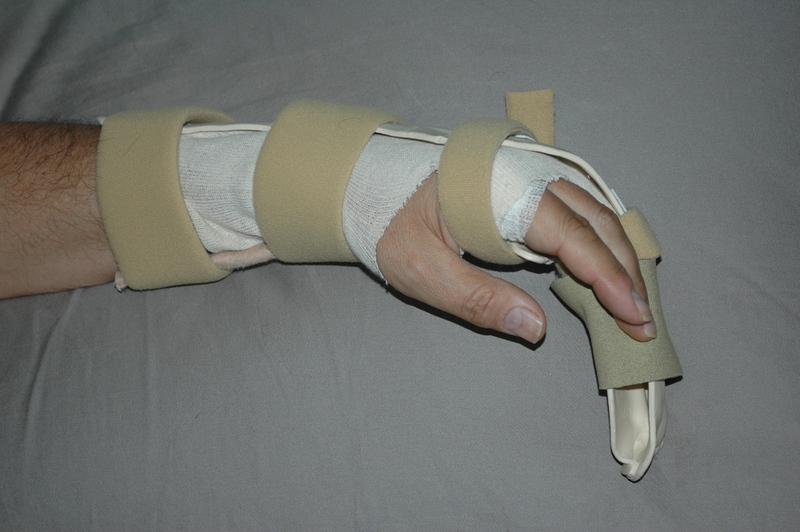 The new splint allows the device to be removed for physical therapy and hand regular hand exercises. Ray’s hand is held at a specific angle that keeps the fingers flexed forward to maintain a geometry that encourages proper healing. The new splint is lighter than the post-surgery cast, but is larger to completely protect the fingers and hand. Currently there is very limited mobility in both fingers, and the remaining fingers and wrist are also rather stiff due to the accident trauma and the fact that the entire hand has been immobilized for two weeks. Working on increasing the range of motion will be the focus on the rehab work in coming weeks. The fingers have large incisions along the top of both fingers, which are protected completely by the new splint. Ray was surprised at the size of the incisions necessary to insert the five screws used to repair the bones. The surgeon will be checking on the healing process on Friday, so we’ll know more about the next steps at that time. Ray’s left shoulder also was treated by the therapist, Shira Siegal, and the treatments already appear to have helped with the pain and range of motion. The therapist plans on continuing therapy on the shoulder in conjunction with the hand rehab. So pleased to hear you are now having physical therapy and Linda is taking care of you. I am looking forward to seeing you both real soon.